H&M has long been at the leading edge of fashion trends with outstanding clothing for the entire family, at reasonable prices! 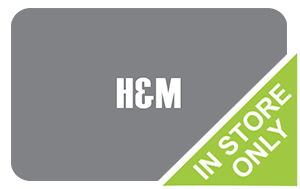 When you purchase an H&M gift card from Cards2Cash, your dollar will go even further! H & M has clothing for every occasion- from the basics to the very hottest trends and everything in between. And that’s not all! H & M has the latest denim trends, accessories, underwear, home goods, cosmetics, and sportswear! Find out why so many customers choose H&M first when they shop for great clothes at reasonable prices! Founded in Sweden in 1947, H&M has grown to a whopping 4,100 stores worldwide by 2016, with further expansion planned. H & M places its focus on providing clothing that is both excellent quality and reasonably priced. What’s more, H&M has strident guidelines for achieving sustainability. From organic cotton, recycled materials, and an eye for conserving water, H&M prides itself as a leader in sustainability. With an H&M gift card purchased from Cards2Cash, you can save money, stay fashionable and rest assured that H&M merchandise has met guidelines devoted to increasing sustainability. Cards2Cash offers gift cards for H&M as well as other great clothing stores and home goods stores. Make sure you check out our listings for other great deals. We carry Hot Topic, Forever 21, TJMaxx. Home Goods and Marshalls gift cards, just to name a few. Let Cards2Cash help you to save money while looking and feeling great. Do you have an H&M gift card that you are not going to use? Cards2Cash will turn your unwanted gift cards into cash. We pay top dollar for gift cards from restaurants, clothiers, hardware stores and more. Just visit one of our retail locations for fast cash on the spot or fill out our easy online form and we’ll get back with you immediately with an offer for your unwanted gift card. Whether you buy your gift cards from Cards2Cash or sell them, we are your one stop shop!